Do I need an Appraisal? Robert Morris Installation at Dia:Beacon, 2016 (recreating works from the 1960s). To celebrate Morris’s prolific and varied career, I could talk about his roots as a founding father of Minimalism. Or I could marvel at his restless lack of complacency, that he continued to evolve and explore up to his last breath (he opened a show of new work at Castelli gallery four weeks before he died, on view through January 25). But instead of jumping into a full career analysis, I’m going to share one, illuminating story about the artist. It was in my History of Aesthetics graduate class at Hunter College that I read that Morris (who, incidentally, also pursued an MA in art history at Hunter, and ultimately taught in the MFA program) issued a “certificate of de-authorization” when the architect Philip Johnson reneged on payment for one of Morris’s sculptures. In doing so, Morris declared the sculpture to be devoid of aesthetic content or meaning as a work of art. An untitled felt sculpture/installation by Robert Morris, 2012. The ballsy move presaged the Visual Artists’ Rights Act (VARA) and Banksy’s recent shredding shenanigans by decades, but also served as one of the most singular art theory anecdotes to get my wheels grinding: who has the ultimate authority to determine the cultural content of a work of art? Can the artist override collective consensus? 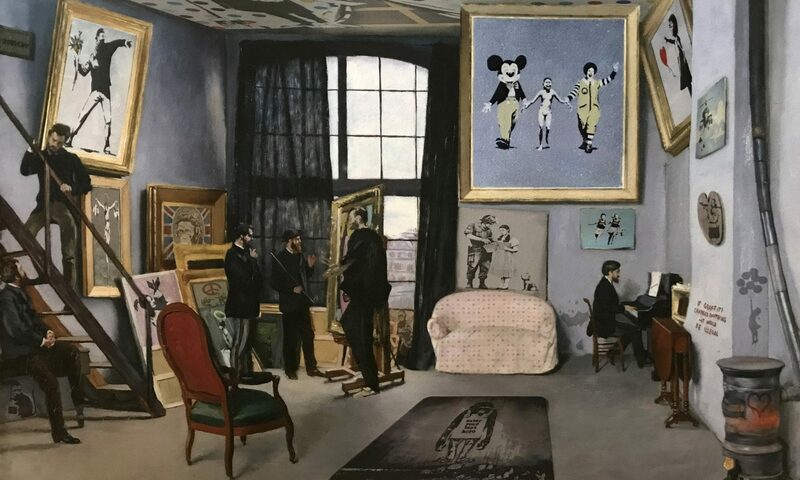 Banksy’s intention to publicly destroy a work of art had the opposite effect; his sensationalized act made the work more famous and valuable (although Banksy seems perfectly fine with that: he did not disavow the work as he could have under VARA—which would really have made the work worthless—but instead “authenticated” it by renaming the work Love is in the Bin). Could Philip Johnson, or society at large, dispute Robert Morris’s dictum, especially before VARA (passed in 1990) gave him legal moral rights to disavow the work? And when the roles are reversed and an audience rejects the aesthetic content of a work of art (that is, consensus is that the work is not good or successful), who is responsible for that “failure”? Throughout the history of modernism, the general public and critics often did not comprehend—and rejected—modern art, and many avant-garde artists were broke and unsuccessful in their time. But it is essentially requisite for the avant-garde to operate on the fringes of society; and indeed, we have romanticized the bohemian “starving artist.” Society eventually caught up with the avant-garde, and “re-authorized” the aesthetic content and value of modern art, sometimes decades after the artist lived. So cultural authority is not only a question of “who” but “when”: what kind of staying power do artists and audiences have to pass aesthetic judgment? In the words of Robert Morris (quoting Chekhov), “art should ask questions rather than give answers.” RIP Robert Morris, and thank you for asking the tough questions. You can also read his full New York Times obituary here.